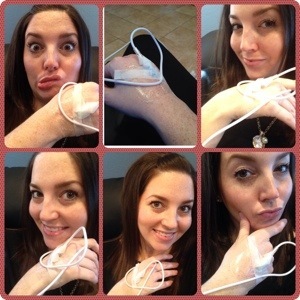 I had my last intralipid infusion last Thursday! This topic has been weighing heavily on my heart to share with you all. I feel that this is a common problem that is overlooked by a majority of RE’s who just don’t understand or know the latest research available. If you have unexplained infertility, endometriosis, history of chemical pregnancies or failed IUI/IVF cycles- please read these articles and advocate for yourselves. Ask your RE for immunologic testing or get a second opinion! The articles and webinar listed link to my RE’s page. I’m not saying to use my RE (although he IS amazing and I would totally recommend him) but he’s always available to do skype consultations no matter where you live. He’s one of the guys leading this amazing research and is very knowledgeable! It’s worth looking into! Here’s a quick version of what his nurse said to me about NK cells when I found out they came back abnormal..
“Your Natural Killer cells did come back as abnormal. Allow me to explain what this means and what we are going to do to counteract these. Natural Killer cells are a normal part of everyone’s immune system. They are what patrol our bodies trying to keep foreign things out of our bodies. Some people have Natural Killer cells that are a little more aggressive. In normal life, this is usually a good thing. Maybe they don’t get sick as often, or if a bad cold is going around it won’t hit them as hard. Natural Killers don’t realize there is a difference between embryos and germs though. They just see something is foreign and doesn’t belong and end up trying to keep the embryo from implanting inside the uterus. Dr. Sher has found that doing an Intralipids Infusion can help to calm these aggressive Natural Killer cells down to allow embryos a chance to implant inside the uterus. There would be an infusion prior to starting the monitoring process. After the embryo transfer if you are confirmed pregnant, there would be a second infusion done. Now go watch this webinar, read these articles and get informed!!! This entry was tagged chemical pregnancy, endometriosis, IL, immunologic, infertility, intralipids, IUI, IVF, nk cells, PCOS, unexplained. Bookmark the permalink. Great info. I am one of those people who rarely gets sick… I know you’ve told me about this before but now you’ve really got me thinking. 🙂 how are you feeling so far? You read my mind, I’ve been wanting to look into this. My doctor has Intralipids highlighted on the list for medications I might be taking, but I’ve never been told my NK cells are abnormal. What test did they do to determine it ( I have to do a endometrial biopsy soon, and I’m wondering if that’s when it might be determined) ? It’s definitely something that interests me, and is something I’ll be asking my doctor about. Thank you for the information! I’m glad you’re looking into it! They did a send out blood test on me.. Depending in what exactly is going on, you either have 2 IL infusions (one before retrieval and one after confirmed pregnancy) or you have to continue them every so often into pregnancy. Luckily I just needed two! Hey Autumn! Feeling much better actually. The fluid has started to go down. I think a lot of the cramping and discomfort was just from fluid and inflammation. I’m able to sleep better except for tons of bathroom trips! Nothing too crazy- heartburn. Very little of anything else. Sometimes makes me nervous. First ultrasound on 4/2! I’m curious… I’m going to keep this in the back of my head and maybe mention at some point to my RE. I am meeting with my doctor later this month to discuss my recurrent pregnancy loss. I was told by nurse that doctor wants to send me for further testing. I do not know what further testing will be, but I will ask him about this.